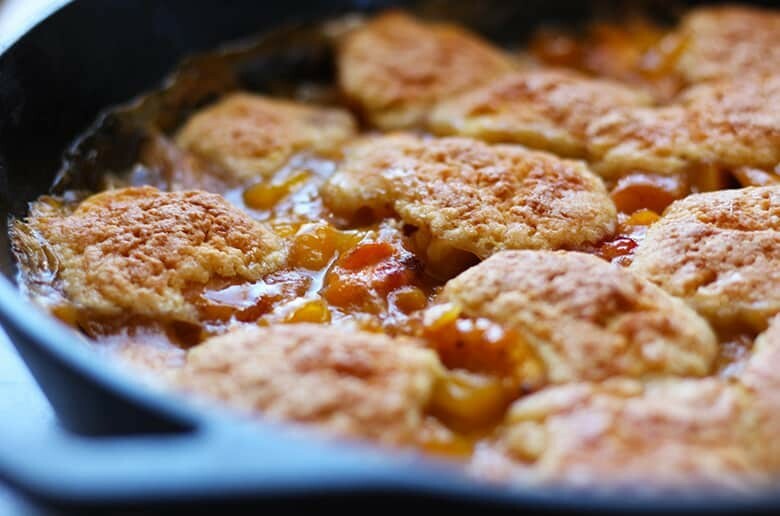 An easy traditional peach cobbler with a cookie-like biscuit topping that perfectly complements sweet juicy peaches. Serve with vanilla ice cream and treat your family to an iconic American dessert. I am not much of a baker. My parents made bread pudding a handful of times but that was about it. They were of that generation after World War II that grew up on frozen and canned food. They didn’t really learn how to cook. In my family, traditional family recipes were forever lost and I never learned to bake. It is my hope that you will treasure your family recipes and pass them on to your children. Because of social media such as Pinterest, Instagram and Facebook, our children’s generation is cooking and may hold on to the family recipes and pass them on. I did dabble in box cake baking in middle school. That motivation developed due to a personal desire for dessert which wouldn’t happen unless I took the initiative. As a young adult, I became transfixed by the Food Network. I often wondered what people did with all of those fresh vegetables I would see in the grocery stores and now the mystery was solved. Before food TV, I only knew potato, tomato, lettuce and onions. 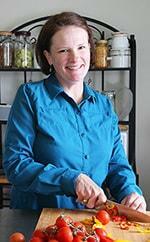 Now I could see how chefs and home cooks transformed rutabagas, parsnips, fennel and jicama. Ironically, television, not grandma, brought real cooking into my home. I am a bit fascinated by the American Peach Cobbler. First because it is easy to make and doesn’t require much baking skill. Second, because it is one of those colonial recipes that developed out of necessity. The early colonists wanted to make their traditional puddings they grew up with but lacked the specific ingredients such as suet. They came up with their own variations of their favorite desserts from back home. Now we have cobblers, crisps, bettys, grunts, slumps and buckles. 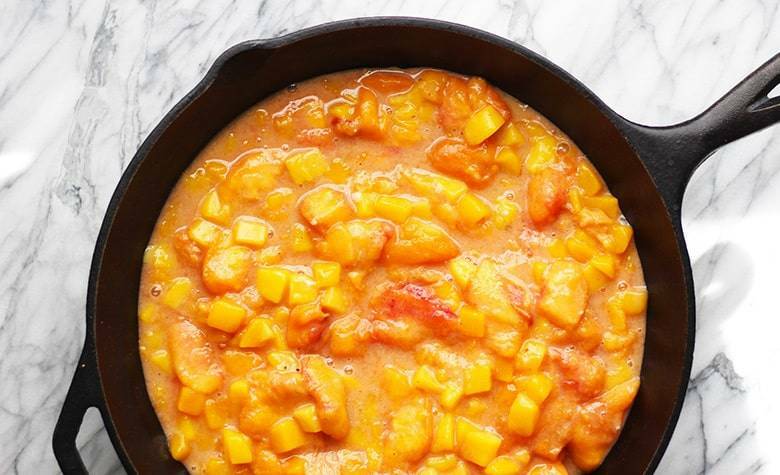 A traditional peach cobbler recipe contains peaches, sugar, butter and flour. After that, the regional and familial variations start. 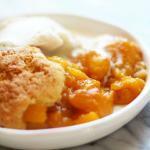 A Southern Peach Cobbler resembles a peach pie more than the northern version of a cobbler. It has a bottom and top crust. It is usually made in a pie pan but can be made in any medium sized baking dish. 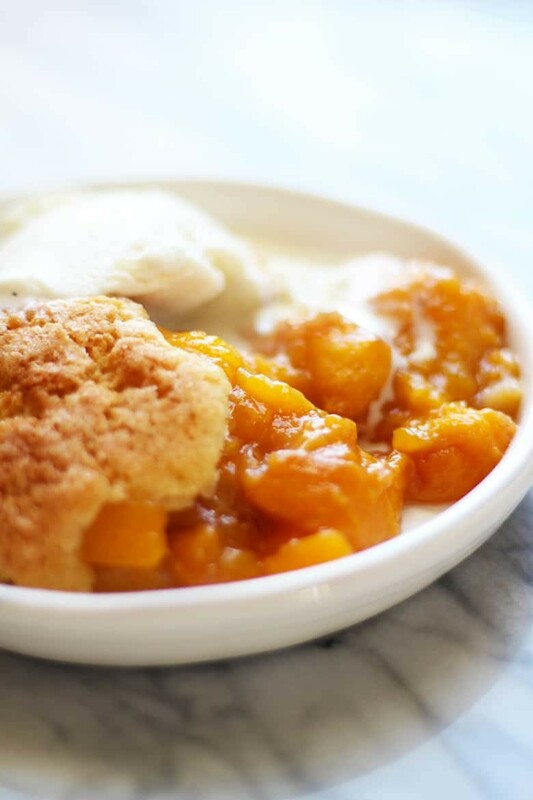 This simple old fashioned peach cobbler can be made with frozen or fresh peaches. I used frozen peaches from orchard peaches I harvested last Summer. I simply sliced the peaches, removed the pit and froze them in a freezer bag. I then thawed them in the refrigerator the day before and popped off the skins. 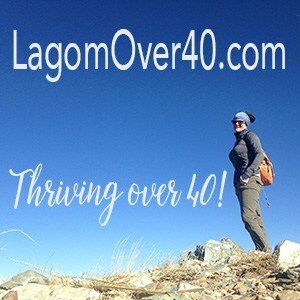 This is the easiest method I have found for removing the skin from peaches. If you use canned peaches, drain off most of the liquid and use less sugar as the canned peaches are packed in a sugar syrup. 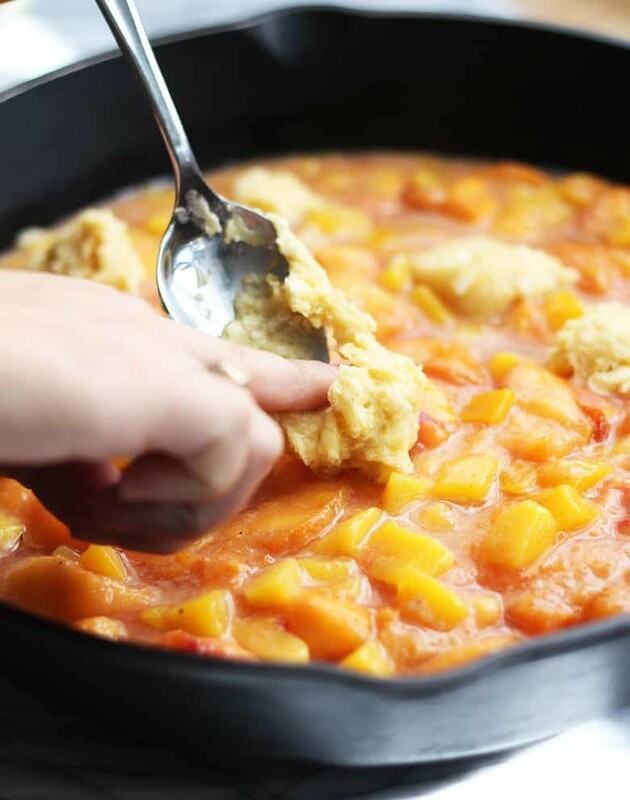 After thawing frozen peaches, drain off half of the liquid to prevent your cobbler from being too watery. 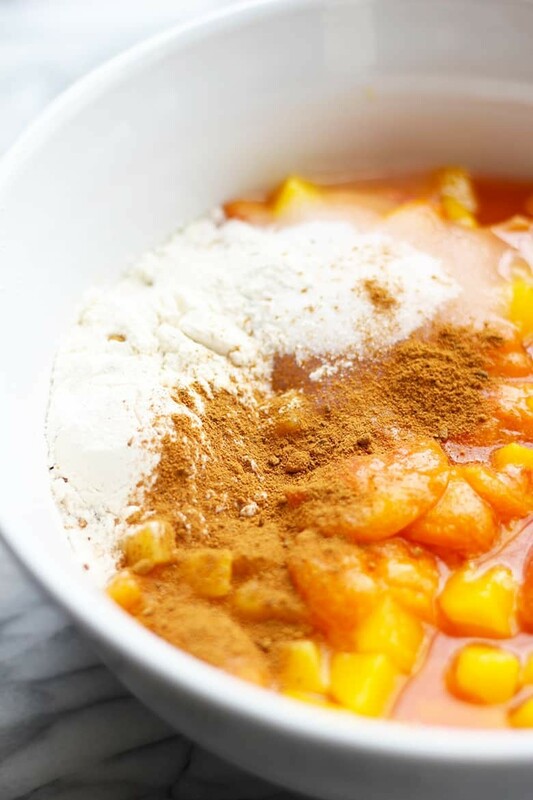 All Purpose flour is added to the peaches to thicken the juices. In a nutshell, a cobbler has two components. The filling which is mixed together in one bowl and the topping which is mixed together in a second bowl. Preheat the oven to 350F, mix your stuff, pour the filling into a greased baking dish and add the topping. That’s it folks. So if you are like me, a bit nervous about baking, take a deep dive into cobblers, crumbles and crisps. What is the difference between a cobbler, crisp and crumble? A cobbler is a deep dish dessert with a fruit filling and a biscuit-like topping. The biscuit or cookie dough is usually dropped in spoonfuls on top of the filling. This dough topping spreads and puffs up as it cooks. A crisp is a the same as a cobbler except the topping is a crumb topping. 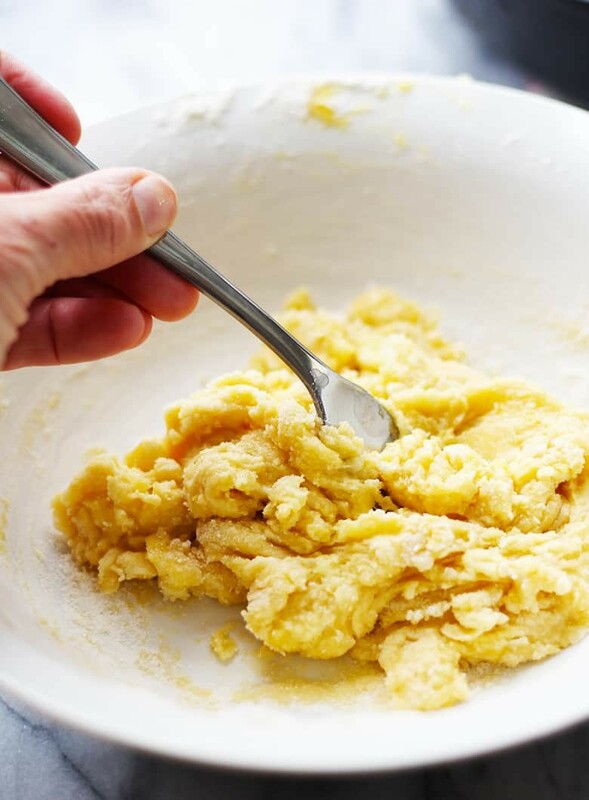 A crumb topping at its simplest is just flour, sugar, oats and butter. You can really get creative here and use crushed cookies, cereal, add some spices etc. A crumble is the British version of the crisp but usually doesn’t have oats. Dive in, don’t be afraid, this is super easy and homemade by you. 4–5 cups peaches, sliced, skins removed and thawed if using frozen. 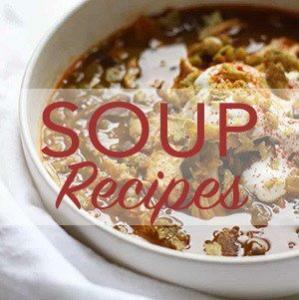 Preheat oven to 350F and grease a 9 inch square baking pan or a large cast iron skillet. In a large mixing bowl, mix the filling ingredients until well incorporated, pout into pan or skillet. 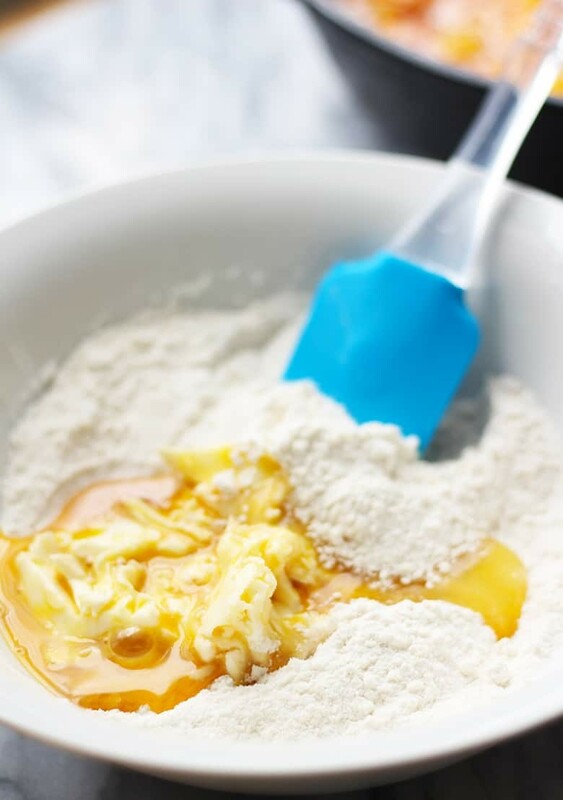 Mix batter ingredients well in a medium mixing bowl. The batter will be thick like cookie dough but should be smooth. Drop by spoonfuls evenly across your filling. The batter will spread when cooking. Bake for 45-50 minutes or until the filling is hot, bubbly and the batter is golden. Let cool for 10 minutes before serving. The filling will thicken as it cools. Serve with vanilla ice cream or creme fraiche. Hailing from the South I enjoy a good Peach Cobbler! This looks wonderful. I saved it for another day. Can’t wait until Georgia Peach Season!! So excited. Like you I’m not much of a baker and apple crumble (British version) or versions of is usually my go-to dessert when I have guests! This peach cobbler looks wonderful. Have to try it! Will make a change from apple crumble haha! Oh, yum. I always love a good peach cobbler. Your recipe looks so delicious, and I love the presentation. Can’t wait to try this! I love peach cobbler with some vanilla ice cream. I am going to have to try making this soon. 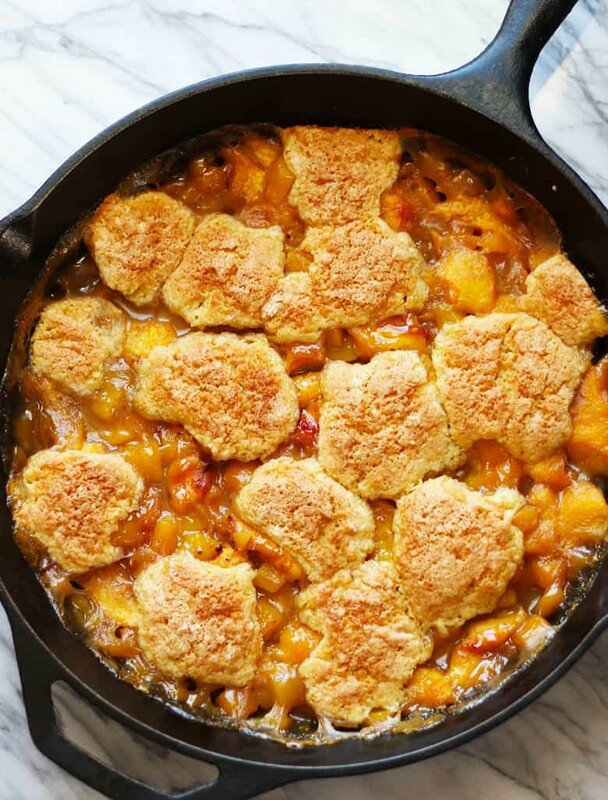 This peach cobbler looks so incredibly delicious! I love that you made it in a skillet! Perfect!